Difficult to imagine that Haapsalu, a town at the Estonian west coast, is a thrilling place. But a medieval castle, where White Lady is appearing at full moon in August, makes the spot suitable setting for HÕFF, annual festival of horror and fantasy films that is held at the end of April. On this occasion, Trash Can Dance has issued a compilation of darker rhythms and voices from the Estonian underground scene. As a small jubilee – 10th release in the TCD catalogue – the sampler provides a good insight into the scene. Spice Mouse opens and closes the compilation with sad songs about vampires and blood, but otherwise the rhythms are well present. Wave and industrial zone starts with Several Symptoms and energetic pop by Mimicry. “Ratatouille” by Opium Flirt, found on the band’s album from 2010, is remixed by 3Pead and carries strong EBM flair while this year’s revelation Cosmos Laguna is engaged in technoid “Underwaterwar”. Then I really like Robosapien that keeps a good balance between melodic layers and EBM-like beats and a good find is also Tagasi Tulevikku that combines machine music with Estonian folk rhythms. Imandra Lake, that made big waves in the alternative scene last year, is on an instrumental shoegaze tip and eclectic Aamen plays with motoric beats and sound effects. Two ladies of Shirubi Ikazuchi conduct experiments with beeps and rhythms and Hypnobooster, to issue much-anticipated debut this year, has a lady doing Estonian vocals on somber but functional backdrop. Great job also by blue chip industrialists from Forgotten Sunrise who go back to native roots and perform a shamanic rock ritual. Coming from manic-depressive department, Morgue’s Last Choice and Edasi have doomed all the beauty in life, whereas Milla‘s echoes and subtle but massive bass is just devastating, partly reminding of Ultraviolence in a dampened mode. Kirst is both majestic and macabre with a meditative contribution of compressor synths. I would rather spend my time on listening to this CD than sharing not so original observations about it. 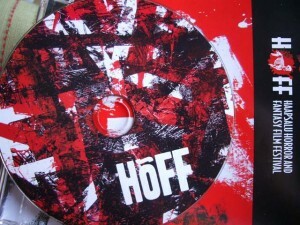 Full tracklist is here: http://http://www.hoff.ee/programm/hoffi-cd.